Art Review: "Shifting Fancies and Celestial Lights," a group show of 15 artists, featuring the paintings of Tracy Vartenigian Burhans. Furchgott Sourdiffe Gallery, Shelburne. Through January. Furchgott Sourdiffe Gallery in Shelburne closes the door on 2007 and ushers in 2008 with an exhibition called “Shifting Fancies and Celestial Lights.” These bright and sometimes whimsical works by 15 Vermont artists, on view through January, provide a visual antidote to the slushy grays of midwinter. Tracy Vartenigian Burhans is the featured artist of the show, and her works are among the most playful. She presents six reverse paintings on old windows, with jocular pears lolling on the segmented panes of glass. A 32-by-32-inch, 12-pane window supplied Burhans’ “canvas” for “Halves and Halves Not.” Seven pieces of fruit are ensconced in this window’s glass squares, like holiday scenes in an advent calendar. More subtle grids compose the foundations of two 40-by-32-inch mixed-media works on paper by Linda Reeves McIntyre. Titled “Diving Deeper” and “Afloat in a Salty Sea,” the vertical compositions are amorphous pools of turquoise, pale blues and lavender. McIntyre imposes structure on this welter of hues by squaring off areas in overlapping segments. She gives greater focus to a medium-sized square in each painting by applying its colors with greater saturation. In “Diving Deeper,” a cadmium-red line along the top of an emphasized square further separates the more intense hues from the rest of the oceanic image. Bonnie Acker’s airy untitled works on paper are also primarily abstract. A 40-by-30-inch, vertical purple scene contains two areas of color, like portions of a meadow, with one section at left and the other deeper in the picture plane at right. Her 12-by-16-inch pastel is a more recognizable landscape: It features a field, a dose of red-orange indicating a piece of farm machinery, and a distant mountain. It’s still nicely indistinct, as Acker has eliminated all but essential details in the scene. Judy Hawkins and Julian Sheres also take on the landscape as a vehicle for addressing their main concerns, which are color, line and paint application. Hawkins’ 26-by-32-inch “Spring Meadow” is focused on a pair of dark-gray, leafless trees in the foreground, painted in an almost agitated manner. A screen of pale-brown saplings stands behind the craggy trees, and further afield is an icy, cloudless, cerulean-blue sky. The simple harmony of light blues and browns behind the foreground trees imparts calm. Hawkins’ horizontal, 24-by-30-inch composition “The Other Side” has a very different feel. A placid, silver-surfaced body of water takes up the lower two-thirds. The far shore has a few trees, which lead the eye to a high horizon line separating a yellow-green sky from a meadow of lilac and light blue. The way Hawkins organized dark values gives the piece its drama. The lower corners are slightly vignetted, and a group of deep-green trees appears at upper left, bracketing the focus on the expanse of water. “Daybreak” by Julian Sheres is a 14-by-16-inch vista of mountains folded one upon the other, growing progressively cooler in hue as they recede deeper into the vista. Orange lines spread across the sky from left to right, illuminating calm bands of cirrus clouds. 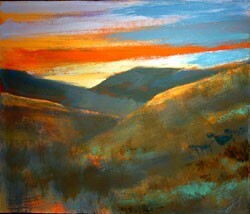 Patches of blue-green in the hillsides make their complementary sky colors more vivid. If the New Year doesn’t bring overdue peace on Earth, viewers can find some relief, at least, in Sheres’ tranquil paintings. In fact, none of the images in “Shifting Fancies and Celestial Lights” are burdened by angst or scenes of war or tribulation. While it’s not a holiday show per se, it does have a mildly celebratory quality.